Maria Sol Escobar, otherwise known as simply Marisol, was born in Paris to Venezuelan parents. She would later find a home in New York City, where in time her unique and varied artistic talents would make a significant mark on the art world. In the 1950s, she worked out of a small loft studio that she shared with a man named Richard Buzzle. In the evenings, she would borrow Richard’s tools. They became friends, and when it came time to part she made him a gift. The gift stayed privately within Richard’s family and was passed down through generations but never publicly exhibited. Years later, it would resurface when mentioned in a 2014 volume about Marisol’s career titled Marisol: Sculptures and Works on Paper. Most recently, it reappeared again when Richard’s daughter and granddaughter brought it to The Center for conservation. Marisol's work arrived at The Center in numerous pieces. Marisol was an artist whose worked changed drastically over the course of her career; she worked in an astonishingly wide range of mediums, including assemblage, drawing, painting, printmaking, carved wood, stone, metal, terracotta, and more. Today, she is more commonly known for her signature sculptural works, which are oftentimes figurative in nature and corporal in size. When this early, more intimate work came to The Center for treatment, we knew it was special. The piece was created in 1954 and is composed of wood, clay, and metal. 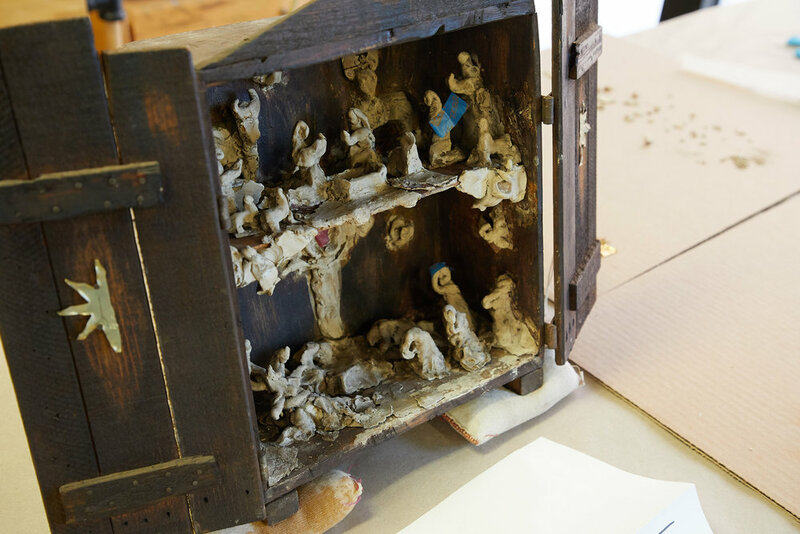 When the work arrived, it had experienced severe handling and age-related damage that had caused approximately 90% of the clay figures to break free from their original location. There were eleven large, loose fragments from the upper scene and eight large, loose fragments from the lower scene. There were also a large quantity of loose, small miscellaneous fragments scattered throughout. 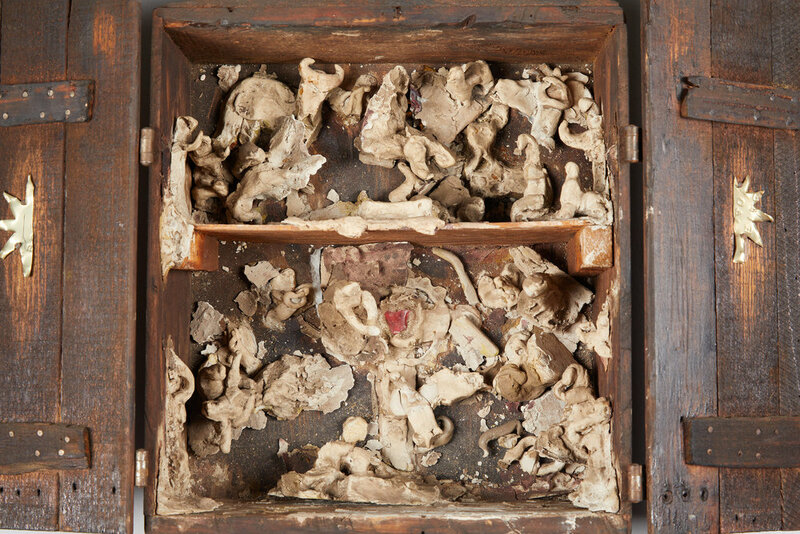 The forms that were still attached to the cabinet had a visible separation occurring. The condition of the work before treatment. It appeared that Marisol used two different types of clay to model the scene, and select areas were painted with a matte grey paint. The clay appeared to have been modeled and then directly applied to the wood substrate. There was evidence of adhesive selectively applied around some of the shapes on the back wall; it was unclear as to whether this was artist-applied or a later repair. 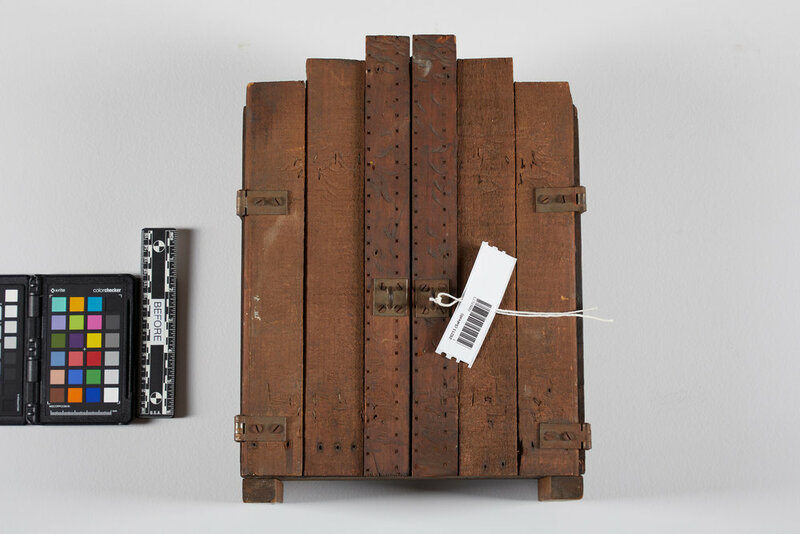 The cabinet was constructed from an old butter crate, and there were two half star shaped metal cutouts attached at the inside of the left and right doors. When the client brought us the piece, they also provided one complete metal star cutout that had detached; however, the original location was unknown. 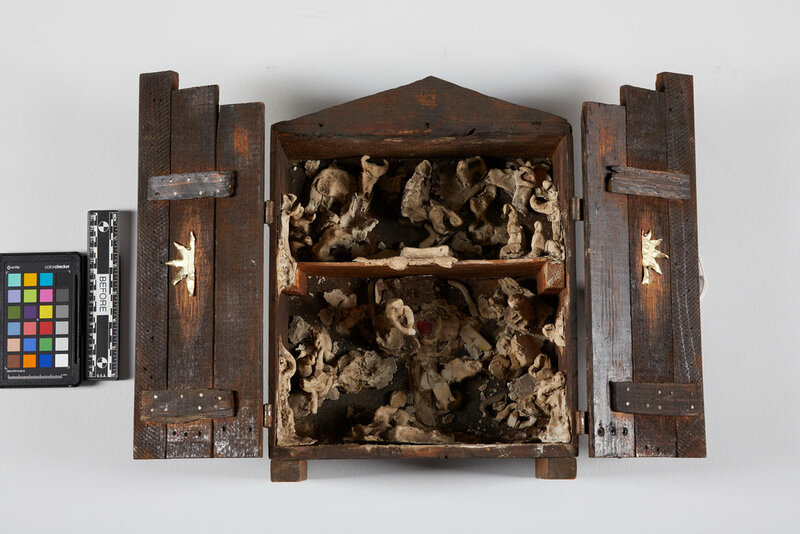 There was a layer of dust throughout the inside of the cabinet, and there were also abrasions on the inside of the cabinet in between the applied forms that appeared to be a part of Marisol’s process. The cabinet was dark in color, which could be an applied stain. There were paint accretions throughout the outside of the cabinet, and the proper left door hinges were slightly loose. 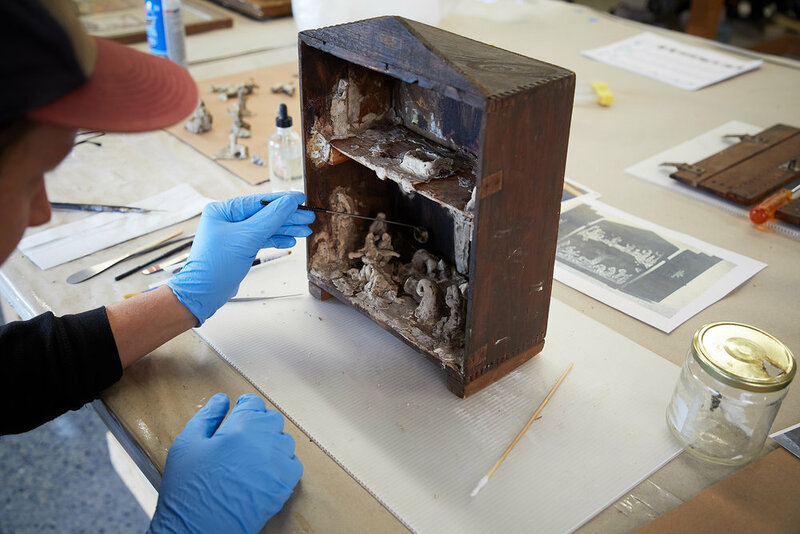 After an initial examination of the piece, our conservator Josh McCauley decided to approach the project through phases. Each phase would be thoroughly documented before, during, and after treatment. To start off phase one of the treatment, all pieces were carefully surface cleaned using the appropriate conservation methods and materials. Next, Josh consolidated any clay forms that were still attached with a conservation-grade adhesive. The loose fragments were located, realigned, and adhered to their original location as best as possible, with the caveat that the location of some of the smaller fragments may not be found due to the extent of the damage. Josh assured the client that any pieces that could not be adhered would be retained and returned to them. Lastly, the proper left door hinges were secured. Josh is now in the process of moving forward with the second phase of treatment, which will include using loose fragments whose original positions are not able to be located as fills for the missing ground. Cracks and small areas of loss will be filled with the appropriate conservation-grade materials and then inpainted. We look forward to sharing the final results with you soon! Marina Pacini; with essays by Bill Anthes, Dore Ashton, Deborah Cullen, and Douglas Dreishpoon. Marisol Sculptures and Works on Paper. Yale University Press, 2014.